The main purpose of this guide is to teach others how to get some useful data from their IMU or just a gyro or accelerometer. The code for Arduino can be found at github: https://github.com/TKJElectronics/Example-Sketch-for-IMU-including-Kalman-filter. It should be pretty easy to implement my code to your own sensor. I will not describe all the details about the theory behind, instead you can look at the sources for more info. It is VERY important that you do not connect the sensor to 5V - this will destroy the sensor. The gyro measures degrees per second (0/s) while the accelerometer measures acceleration (g'a) in three dimensions. Both outputs the measurements as a analog signal. gyroRate = (gyroAdc-gyroZero)/sensitivity - where gyroAdc are the readed value from our sensor, gyroZero is the value when it is stationary (this is done in the code - look in the "Setup" section) while sensitivity is the sensitivity found in the datasheet, but translated into quids. Where accAdc is the analog reading and accZero is the value when it reads 0g - this is calculated in the start of the code, look in the "Setup" section. 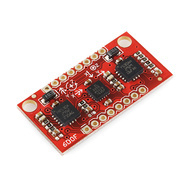 The zero value can also be found in the datasheet: http://www.sparkfun.com/datasheets/Components/SMD/adxl335.pdf. You will see that the zero voltage at 0g is approximately 1.5V, to translate this into quids, you again have to use this equation: zeroVoltage/3.3*1023. Atan2 has a output range from -? to ? (see http://en.wikipedia.org/wiki/Atan2), I simply add ?, so the range it converted to 0 to 2?. To convert it from radians to degrees we simply multiply the result by 57.295779513082320876798154814105 - this is predefined in the Arduino IDE as RAD_TO_DEG. As I explained earlier the gyro is very precise, but tend to drift. The accelerometer is a bit unstable, but does not drift. You can calculate the precise angle by using something called a Kalman filter. A detailed guide on how it's implemented can be found at my blog: http://blog.tkjelectronics.dk/2012/09/a-practical-approach-to-kalman-filter-and-how-to-implement-it/. If you want to use something a bit more simple, you can use what's called a Complementary Filter. It is pretty easy to understand and the math is much simpler, because it only works in one step. angle = 0.98 *(angle+gyro*dt) + 0.02*acc - you can fine tune the numbers to whatever you like. Just remember that the sum must be 1. You have now learned (hopefully) how to get analog data from IMU and translate it to something useful. I have attached my own code for my 6DOF IMU (http://www.sparkfun.com/products/10010), but with some slightly modification, I am pretty sure that it is possible to use it with any analog gyro/accelerometer. If you have any question, fell free to post a comment below. The code can be found at github: https://github.com/TKJElectronics/Example-Sketch-for-IMU-including-Kalman-filter/tree/master/Graph. It is also possible to see the data from the y-axis. Just uncomment drawAxisY(); in the code. Below is a video of my balancing robot. It uses the same IMU and algorithm as described in the post above. I have just released my balancing robot on Kickstarter: http://www.kickstarter.com/projects/tkjelectronics/balanduino-balancing-robot-kit. Please consider backing the project. I have also provided code for several other IMUs including a 9DOF which allows you to estimate yaw as well. All can be found in the Github repository: https://github.com/TKJElectronics/Example-Sketch-for-IMU-including-Kalman-filter. 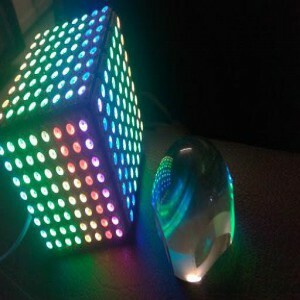 Check out ULTiM8x8 on Crowd Supply! Thanks for posting this guide. I will give it a go! I am making a 3 axis rate table to measure how accurate the imu is. 1)For a given set of sensors, how can i get the best possible performance from my Kalman filter in estimating angles. 2)Now that the "optimal" Kalman filter code is identified, can i achieve better performance by choosing better gyros and accelerometers. Thank you. Are you using the same IMU as me or a different one? If so will you please tell me what you come up as the best values for Q_angleX, Q_gyroX, and R_angleX? R is the co-variance matrix. It should typically be the square of the standard deviation of the Gyro. I think it should be there in the datasheet, or you could just keep things stationary and log the data for about 5 mins. Calculate the mean and std deviation. This is a great post about IMU's. Lots of good information. I am also working with Gyro's and accelerometers in my Quadrotor project. I needed a simple tool to visualize data and ended up writing one. Although there are ways to plot data using Processing, I wanted a stand alone tool. Here is link to relevant thread. Hope you guys find the tool useful. I will probably change the tools to accept float data in the next version. What unit do you measure the standard deviation and mean in? For example is it %/C or what? This is a great for IMU-starters like me. I will give it a try. This isn't working for me. My angle is still drifting at a degree per second. Are u using the same IMU as me or a different one? If not, try to change the value of R_angleX and R_angleY and see if it helps. I'm using a different one, the digital combo board. http://www.sparkfun.com/products/10121. I had to mod the code to suit the digital version, but i'm confident it works. Sometimes the result jump about 20 degrees, quite rarely. Does this ever occur for you? It sounds like you are getting data from the accelerometer. I you sure you are using both sensors? Haha, yeh definitely getting all the data For some reason i get more accurate data from the non filtering. The calculated accelerometer angle doesn't go through 360degrees. Gets about a max of 50. Is this supposed to happen? Try to use the complementary filter instead and see what happens.